SAK website provides some basic facts about working in Finland. You should also know these things if you are starting a new job. You find all SAK news and articles under Material. There you can also download our publications, SAK logos and slogans, and photos of SAK staff. Test your working conditions on the renewed Good Job Barometer! New employees should immediately check their agreed terms and conditions of employment against the collective agreement for the working sector concerned. 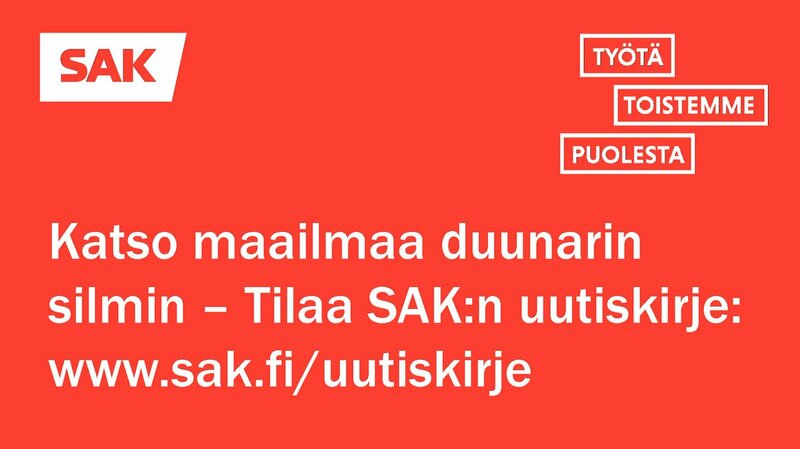 The Central Organisation of Finnish Trade Unions (SAK) is a labour confederation representing approximately 900,000 members organised in 17 affiliated trade unions. Local authority childminders, flight attendants, bus drivers, waiters, construction workers, paper mill employees and professional dancers all work in sectors organised under the broad SAK umbrella. Our mission is to build a humane, secure and equitable world of work, and to realise a society based on trust in which effective labour legislation, comprehensive collective agreements and long-term bargaining give employees faith in a better future.